"......this latest musical adapted from one of Disney's popular movies defied my dour expectations � Aladdin � has an infectious and only mildly syrupy spirit... the score � has been adroitly, not to say exhaustively, exploited for any and every opportunity to indulge in extravagant musical numbers � An appetite for similar ba-dum-bum humor (some choice, some groan-worthy) will increase your enjoyment of Aladdin � � Most of the numbers not involving chorus members in chest-baring vests and harem pants tend to pass by without making much of an impression. Although Mr. Jacobs and Ms. Reed have solid voices, even the movie's big hit song, the pretty Menken-Rice ballad A Whole New World, � lands rather softly � the production's relentless razzle-dazzle and its anything-for-a-laugh spirit also infuse the show with a winking suggestion: If you can't be yourself, just be fabulous." "...Directed and choreographed by Casey Nicholaw, the show is as colorful as the Crayola 64 box, and as tirelessly energetic as a toddler, but it also feels canned. While burning through wishes, you should ask for the musical to have a lot more heart � In lieu of soul, the show pours on the droll...The production's best special effect isn't the carpet, but the rollicking and endearingly over-the-top turn by James Monroe Iglehart... Iglehart shines with enough charisma to light a thousand and one nights." "...James Monroe Iglehart is just so magically delicious as the guy in the lamp that the show sometimes feels like its holding its breath until he reappears. That's not a knock on this perfectly lovely adaptation of the 1992 movie � It's spritely directed and choreographed by Casey Nicholaw, well sung by a huge 35-person cast wearing an alarming number of harem pants, and hits that sweet spot Disney Theatrical Productions do so well, a saccharine fairy tale for the kids cut by some sly, vinegary quips for their parents � A welcome bit of casting is having Jonathan Freeman return as Jafar, the same role he voiced in the animated film. He is simply delicious, relishing his evilhood � Bob Crowley delivers on another dazzling Disney design � Director Nicholaw juggles all of this with supreme skill, perfectly pacing the romantic with the comedic and the dancing..."
"...Directed and choreographed by musical comedy specialist Casey Nicholaw with loads of retro showmanship, an unapologetic embrace of casbah kitsch and a heavy accent on shtick, this is sweet, silly fun. It's not the most sophisticated entertainment, but the target demographic won't mind at all � the songs are tuneful, if not quite top-drawer � While Williams' vocal performance in the movie was quite large, Iglehart's high-energy turn is perhaps even larger � He's a delight � But the romantic pulse of Aladdin is a little faint. Jasmine is a less captivating version of Belle and Ariel before her � While Reed sings sweetly, she's more like a curvy Kardashian than a Disney princess � In leaning so heavily on the campy humor (yes, there are "Walk Like an Egyptian" dance moves aplenty) the creative team has slightly shortchanged the show on earnest sentimentality, which for better or worse is an essential Disney ingredient. That makes Aladdin's appeal somewhat juvenile..."
"... �if you're up for a meaningless fling, it might as well be with a pro. And Aladdin, for all its desert emptiness, plays by the rules � A strict adherence to Best Practices is maintained throughout � maybe not quite soon enough, comes the knock-'em-dead first-act production number, (You Ain't Never Had a) Friend Like Me, � in which James Monroe Iglehart as Genie buys, at the cost of a possible hernia, his Tony nomination. Casey Nicholaw, buys his, too � he can stuff a dance with so many tricks and jokes that it becomes, in its sheer too-muchness, a weirdly pure abstraction of fun. So why is Aladdin a bit of a chore? Its jaw-dropping moments are nicely spaced and the intervening longueurs not too long. Beguelin has wisely selected what to borrow and what forgo in switching from animation to stage � Alan Menken's music is consistently delightful � But even the best of what the writers offer doesn't seem to stick very long; if it weren't for Nicholaw's merciless flogging, you feel the story would simply evaporate in the desert heat � If the whole enterprise is arranged to prevent us from taking anything seriously, why should we respond when we're suddenly asked to care?" "......if the producing giant's eight Broadway musicals haven't all been as successful, "Aladdin" lands near the top. Based on the animated feature film, this is a wonderful adaptation filled with color, charm and loads of theatrical magic. When all the pieces fall into place, the Disney formula makes for unbeatable family entertainment: Attractive romantic leads, snappy humor and dastardly villains - combined with melodically clever tunes and a satisfyingly happy ending. It's all here with the added bonus of ravishing technical designs, incredible stagecraft - how do they make that carpet fly? And a show-stopping turn by the phenomenal James Monroe Iglehart as the Genie." "......Casey Nicholaw stylistically turns the film's romantic fairy-tale adventure into shtick comedy. Bob Crowley, a six-time Tony winner, is likely to pick up another one for imaginative sets that capture both the fun and the storybook wonder of the folk tale � costumer Gregg Barnes makes a dazzling first impression � But in the spirit of overkill that comes to define the entire production, the costumes become so heavily encrusted with bling, it's a wonder anyone can move in them � The versatile James Monroe Iglehart not only pulls off his garish Genie costume; he practically walks off with the show in Friend Like Me" � changes to the original material are less successful, especially the contemporary updates to book and lyrics that replace the tone of fairy-tale innocence with show-queen vulgarity... It was a really bad idea to replace Iago... with an annoying human henchman played by an annoying actor. A worse idea was replacing Abu, Aladdin's rascal monkey friend, with three of the hero's dumber-than-dirt slacker pals." "...It's safe to say that no Broadway performer is currently burning more calories per second than James Monroe Iglehart does during Friend Like Me, an eight-minute joyride featured near the end of Act One � [Robin Williams is] an act that would be impossible to reproduce, so Iglehart, abetted by director/choreographer Casey Nicholaw, simply tops it � If Disney Theatrical's latest production doesn't sustain that frenzied high throughout, it delivers a rush that may surprise folks � The libretto here is sharper, and deftly refines a less-than-stellar screenplay � this Aladdin shows more imagination, and has more fun � Beguelin uses obvious jokes and references, yet they're delivered with such gleeful savvy by Nicholaw and his excellent company that you suspend skepticism and dive right in." "...Disney's new Aladdin � doesn't quite catch lightning in a bottle but it lets a pretty nifty genie out of a lamp. That would be James Monroe Iglehart � Every time this Genie's on stage, it's as if Aladdin � were mainlining Red Bull. Iglehart works so hard during his big number, you fear for his health that is, when you're not laughing your head off. And then there's the rest of the show � The only acolyte who stands out is Jafar's wisecracking henchman, Iago � The pair have a great physical rapport Rivera short and round, Freeman tall and hulking and their evil cackles are a delight � Yet there are incomprehensible hiccups. Chorus boys in harem pants are going to look like extras in an MC Hammer video no matter what, but scenic designer Bob Crowley's cruise-ship Arabia shouldn't look so cheap. Beguelin also lays on the Borscht Belt shtick with a trowel..."
"...As staged by director-choreographer Casey Nicholaw, it's part children's theater, part magic show, and part Nick at Nite sitcom complete with broad acting and groan-inducing puns (''Welcome to Dancing With the Scimitars!''). James Monroe Iglehart plays the genie as a cross between Robin Williams (who voiced the role in the 1992 film) and RuPaul. He brings welcome energy, particularly in the overlong first act, but his faux jive and finger-snapping can wear as thin as one of Scheherazade's veils. More grating are the stock villains of the show � Overall, this is one of the better Disney stage musicals, complete with several eye-popping production numbers that benefit from Nicholaw's spirited choreography, Bob Crowley's elaborate and chameleonic sets, and Gregg Barnes' glittery costumes." "...The carpet flies, kids, and it's awesome � what's a whole new world, as the song promises, is the almost modest, down-to-earth human scale of director-choreographer Casey Nicholaw's big, cheerful production -- an enjoyable throwback to old-time musical comedy... There is a by-the-pants looseness to the style that feels a bit slow in the first act but picks up gleefully after intermission � The result is sweeter, with spiky comic humans who almost make up for the missing animal sidekicks, and with three endearing Ashman songs that didn't make it into the film." "......the musical comedy that just opened at the New Amsterdam Theatre is all about one character: the Genie. That's due to the casting of the energetic James Monroe Iglehart, who all but erases the memory of Robin Williams, the voice of the Genie in the 1992 animated film. It's rare that you see an actor playing a character he was born to play in a career-defining performance � Director and choreographer Casey Nicholaw (The Book of Mormon �) has done wonders staging Aladdin. � Nicholaw uses his multicultural ensemble flawlessly, unraveling layers to each number that surprise and wonder. You'll also marvel at Gregg Barnes' stunning costumes � What results is a fast-paced, quick-witted tale � Not all these changes work for the best � As our two romantic leads, Jacobs (The Lion King �) and Reed (In the Heights �) certainly give the earnestness and edge each of their characters demand. But their performances are outshined by stronger supporting characters � Menken's four new songs, with lyrics by Beguelin, are a bit forgetful. But they move by so quickly, you won't be able to dwell." "......the show is a tricked-out, tourist-family-friendly theme-park attraction � As in the 1992 film, the Genie steals the show from its eponymous street rat � hero � Aside from the tonic of Iglehart's djinn, however, Aladdin is short on magic. Director Casey Nicholaw fills the stage with activity, and Jonathan Freeman and Don Darryl Rivera offer ripe turns as a villainous vizier and his squawking sidekick. But the plotting drifts into weightless silliness, with a surfeit of generic padding and glitz. 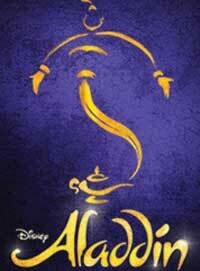 There's the rub: The musical is called Aladdin, but seems content to be Prince Ali." "...Suffice to say, Aladdin � bears no resemblance to Nicholaw's previous laugh-filled Broadway effort, The Book of Mormon. � And neither does Chad Beguelin's book, which is loaded with some clever Sesame Street � word play but finds no magic whatsoever � Jacobs and Reed offer big Broadway singing voices that eschew the homogenized crooning of their animated predecessors. But Aladdin's cohorts Babkak (Brian Gonzalez), Omar (Jonathan Schwartz) and Kassim (Brandon O'Neill) are characters better left on the cutting-room floor along with their Menken/Ashman song High Adventure, � not to mention their new Menken/Beguelin song Somebody's Got Your Back. � Jasmine is another of those Disney princesses who, unlike ingénues of yesterday, turns out to be just as brash, aggressive and obnoxious as the men around her. It's a curious conflict: trying to be feminist and yet telling stories that aggrandize royalty, the most repressive class-driven institution known to man." "...If the production, with its sequin-heavy costumes and big-chested chorus members (of both sexes), seems stuck in the 1990s, at least the songs weren't plucked from a book of pop standards � Neither does the Friend Like Me �'s excitement stem from choreography: Nicholaw, who staged The Book of Mormon, is adept at keeping bodies in motion but the movement itself is Broadway-generic. No, Friend Like Me � achieves delirium owing to the performance of James Monroe Iglehart as the genie. Unlike Adam Jacobs, the suave and effortless portrayer of Aladdin, or Courtney Reed, the sweet Jasmine, Iglehart is James Brown tinged with RuPaul... After a string of recent less-than-smashing Broadway adaptations, Disney wanted something it could market not only to the parents-with-children crowd but also to date-night couples looking for a few laughs. Wish granted." "...The magic carpet flies smoothly and so does the rest of Aladdin, � a buoyant musical comedy fashioned from the 1992 Disney animated feature. Crafted as old-school Broadway show, Aladdin � conjures up plenty of entertainment for the family crowd � Aladdin � wisely never takes itself seriously � Alan Menken, the ever-melodic composer, supplements his pretty film score with several upbeat numbers with nifty lyrics from Beguelin. An energetic and appealing company delivers it all with confidence � Casey Nicholaw, an ace director-choreographer, maintains a slightly tongue-in-cheek quality throughout the fast-moving show, especially in his frisky dances that � Nicholaw and his designers certainly provide a pleasing eyeful � All in all, Disney Theatrical Productions has done a top-notch job of translating Aladdin � from the screen to the Broadway stage, where it likely is to fly high for a long time to come." "...Everything else [other than Iglehart's performance] in Aladdin is, like the endlessly expansive desert in which it's set, dusty and unwelcoming. Yes, it's livelier and more watchable than Disney's other recent stage ventures, primarily because no Disney stage musical to date has seen a star turn like Iglehart's � it suffers from a serious identity crisis: wanting to be a blockbuster, but without the writing, direction, design, or, most critically, guts to back up that aspiration. It also is creepily unsteady on matters of tone, as librettist Chad Beguelin has upset the movie's fragile but definite balance between seriousness and jokiness... director-choreographer Casey Nicholaw does not help matters � The score, or most of it, asserts itself. The songs Alan Menken wrote for the film remain glimmering jewels � The incredibly likeable Jacobs is obviously talented, but fails to project much in the way of charisma. Reed sings prettily, but is blander still Aladdin seems determined to give you little, if anything, worth looking at or thinking about." "......largely delightful � It is the very essence of one of the old Bob Hope-Bing Crosby road pictures � Aladdin has many of the standard Disney tropes � But all of these are overruled by an anarchic sense of fun, courtesy of director/choreographer Casey Nicholaw and an antic cast � Jacobs immediately establishes himself as a personable, big-voice leading man with a light comic touch and a smile that radiates to the back row of the balcony � You've seen it all before, but even here, things are livened up considerably by the number � "Friend Like Me," which may be the most deliriously over-the-top piece of comic choreography to be seen in New York in a long, long time � Nicholaw is the wittiest choreographer working on Broadway at the moment. The second act pretty much goes from strength to strength � In all respects, not just Barnes' costumes, Aladdin looks great... its exposition is draggy, and at times its insistent wise-guy tone can become a tad grating � But for sheer rowdy fun combined with sophisticated musical staging Aladdin is going to be hard to beat." "......the talented director-choreographer [Nicholaw] proves to be at the height of his game � this sure-to-be megahit, slickly adapted by Chad Beguelin from the hit 1992 animated film of the same name, has many pleasures to recommend it. But it's two of Nicholaw's inventive production numbers that will have audiences buzzing when they leave (and in one case, standing on its feet mid-show) � Fortunately, there's much else to enjoy in this ultra-colorful and highly entertaining show, whether you're a kid, an adult, or somewhere in between. Beguelin's pun-filled book has plenty to keep the grown-ups chuckling and will have the youngsters paying complete attention. The score is often hummable and never less than serviceable � In a Broadway musical season that has so far been a bit disappointing, it's a bonus to finally see a show that has as much magic as Aladdin. It may not be completely out of this world, but it will absolutely lift your spirits." "...The theatrical sorcery runs out when it comes to the story. Chad Beguelin (Elf) contributes additional lyrics and a clunky book to this updated version. His addendum is not enough to derail an otherwise fantastic spectacle of a show, though it makes a good effort � Beguelin has made a few smart changes for the stage � Beguelin's adaptation is witty and seemingly perfect for a story as comedic and self-referential as Aladdin. The book is also chock-full of baffling missed opportunities � The whole stage sparkles with a delicious mixture of fairy-tale orientalism and Broadway glitz, further enhanced by Director Casey Nicholaw's fresh and fun choreography. 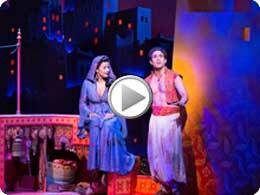 Disney magic abounds thanks to the astounding work of illusion designer Jim Steinmeyer � Jacobs is everything you'd want in an Aladdin � You're going to have a great time at Aladdin..."
"......the genie grants theatergoers the first of their wishes � to be entertained. The genie is James Monroe Iglehart, and he is the one who provides the bulk of the entertainment � If there is much that dazzles � not all happening on the stage of the New Amsterdam Theater is everything that every theatergoer might wish for... [Iglehart] has exquisite help from director/choreographer Casey Nicholaw who has created the kind of old-fashioned razzmatazz choreography that's been wowing them at The Book of Mormon" � This is a show that is massively fun to look at... the score is not Menken's best. Still... even middling Menken can be rousing and mellifluous � Chad Beguelin's book exceeds the acceptable quota of dumb jokes � The lyrics fare better � The cast is made up of more than three dozen complete professionals, with many stand-outs... It's also not really their fault that their characters are so bland, despite efforts to give them some personalities � But whatever the billing, let's face it, the star of Aladdin � is James Monroe Iglehart."